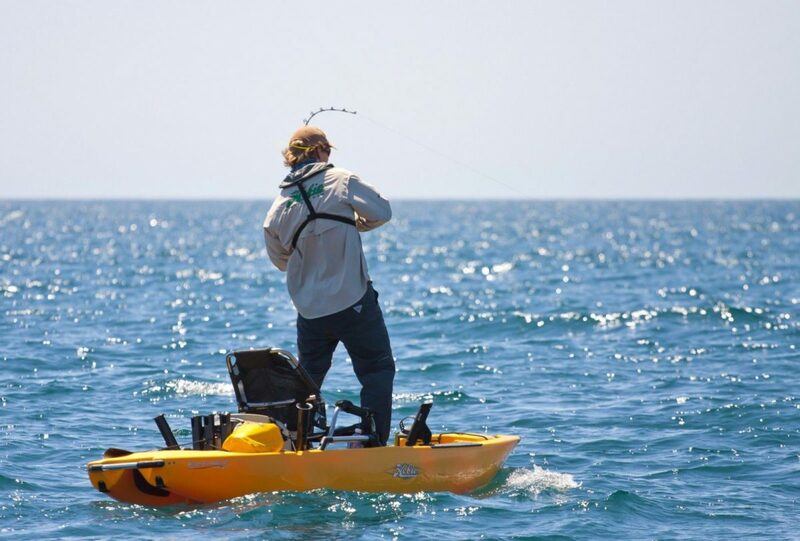 Fishing kayaks like this Hobie Pro Angler have become immensely popular, and with good reason. The popularity of fishing kayaks has simply gone through the roof. There are plenty of reasons why, and if you’re an inshore angler, you may want to consider a fishing kayak for your next boat. Let’s look at the pro’s, and the con’s. -You have amazing stealth, and can sneak up on fish. In many conditions, you will manage to out-fish the guys on larger boats which have motors. -You can get into places no other boats can go. Draft is just a few inches, and tight creeks and cuts are no problem. You can also launch anywhere you can walk to the water, no ramps or even roads are required. -Kayaks are less expensive than larger boats. That doesn’t mean they’re cheap, and the fancier models go for thousands, not hundreds, of dollars. But when compared even to reasonably priced boats (read 3 New Boats Under $15,000 for a few examples) they cost a whole lot less. -Kayaks turn fishing into a more or less solitary experience. True, kayak anglers do often fish in pairs or even packs. But you can’t just invite two or three friends out for a day of fishing, as you would on a traditional fishing boat. -Small boats like yaks are more subject to weather conditions. They offer zero protection from the sun, get tossed around by the waves, and if it rains you will get wet. Wait a sec—even if it doesn’t rain, you’ll probably get wet. -Long runs to and from distant fishing spots are not an option. You can get around this a bit by driving and launching closer to hotspots (which may be impractical with a trailer-boat due to ramp locations) but if the bite is slow in an area, you’re more or less stuck there. So: should a kayak be your next fishing boat? If you can afford to add one to your existing fleet, the answer is a resounding “yes”. But if you can’t swing both a kayak and a traditional fishing boat, you have some tough choices to make. Just be sure to consider all the pros and cons, before making them.